UofL is ranked among the "Best of the Best" for its LGBTQ inclusiveness and is one of only 16 schools in the nation to earn five out of five stars in the Campus Pride Index by the organization Campus Pride. A number of initiatives contribute to these accolades, including the LGBT Center's Safe Zone Training to provide faculty and staff tools and resources they need to understand LGBT students and create a welcoming, affirming campus environment for all. The effort is being amplified into an Ally Campaign, officially launching this week. The campaign comes on the heels of a study conducted last year to gauge the climate for LGBTQ people on the HSC campus. "One of the biggest themes that came out of that study is that LGBT people said they were hesitant to come out and that they didn't know who their allies were," said Chaz Briscoe, program coordinator senior for the LGBT's HSC satellite office. Briscoe notes that while UofL is an LGBT-friendly campus, staff, faculty and students are often reluctant to come out because they don;t know who to trust. This campaign is a way to make their working environment more comfortable. "We want allies to make it known and say out loud. 'you can trust me.' Our goal is to help people identify who and where their safe spaces are," Briscoe said. 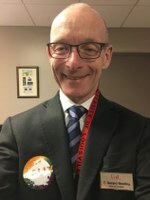 The campaign will launch with email messaging featuring Snapchat-inspired selfies of all four HSC deans- T. Gerard Bradley (Dentistry), Marcia Hern (Nursing), Toni Ganzel (Medicine) and Craig Blakely (SPHIS), as well as faculty and students displaying their ally stickers. "I show up as an ally by proudly showing my pride"
"Being an ally means letting others know i'm an ally"
"Allies make you feel like you belong!" "Be an ally, join HSC Pride"
Training: The HSC office is offering Safe Zone Training sessions for those who want to be an ally. Training includes topics such as the history of the LGBT community, why it is important to know about this population and the social stigma that comes with being a sexual or gender minority. The first Safe Zone Training is Feb. 24 from 12-1:30pm. Registration is open online. Another session is set for March 3 from 12-1:30pm. More information is available online. 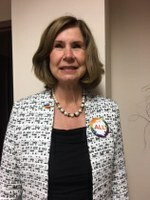 Show support with an ally symbol: Email the LGBT Center for a free ally symbol to communicate your commitment to creating a safe, welcoming HSC. You will also receive a self-guided training packet to help you grow further as an ally. Join the LGBT Center's Ally List: Let your colleagues, students and potential applicants to your program know you are an ally by adding your name to the LGBT Center's Ally List. Sign up as a LGBT-friendly healthcare provider: Add your name to the OutCare or ULP provider websites, and send a powerful message of inclusion to patients who are actively seeking LGBT-friendly providers. Sign up on ULP's website by emailing ULPMarketing@ULP.org and join the state-wide OutCare website. Briscoe said this campaign will run indefinitely and the office hopes to continue adding more layers, including panel discussions and lectures. More information about the Ally Campaign is available by contacting the LGBT Center on the HSC campus.